He’s the muscular Hollywood action hero who has one of the most envied physiques in the industry. And now, Chris Hemsworth, 35, has revealed that his gruelling workouts are inspired by Australian native animals. 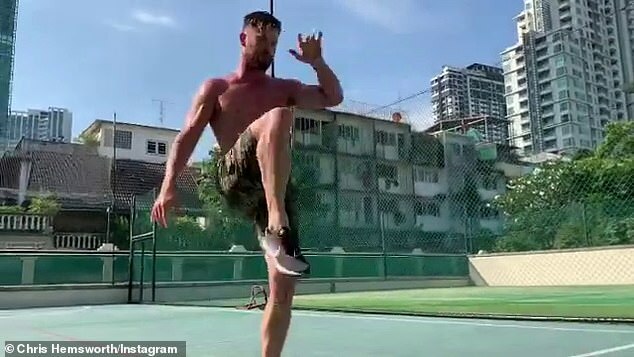 The hunky Australian star took to his social media pages on Saturday to share footage of himself completing a routine, which involved him channelling a range of native animals including goannas, kangaroos, koalas and even a platypus. ‘Bears, bears, bears!’ he adds, before Chris corrects him. ‘They’re called wombats!’ he yells. Zocchi then yells for him to do the ‘gorilla’ move, before Chris informs him they’re actually called Kangaroos. ‘Let’s go roo boy! Bounce, bounce, bounce!’ barks Luke. Chris finishes the workout by running back down the court before collapsing on the ground panting. ‘Trying to lock in on my workout spirit animal for 2019,’ Chris wrote on Facebook. It comes after the actor’s personal trainer Luke, revealed the surprisingly simple secret behind the Chris’s super buff physique. 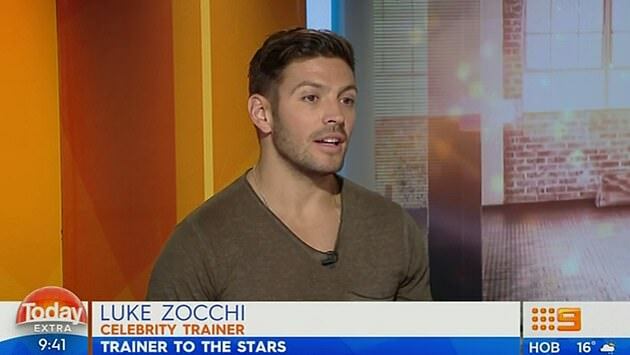 Speaking on TODAY Extra in November, Luke said he developed a simple 20/20 workout for the star. Explaining the fitness regime, Luke said Chris does 20 squats and 20 push-ups each hour on the hour during their 10-hour day together. ‘Me and Bobby (Chris’s stuntman) started this,’ Luke, who also trains Chris Pratt and Oscar-winner Cate Blanchett, divulged. Luke also explained that he creates a different fitness regime for each character Chris may be playing. The A-list trainer said aside from getting training right, a simple and nutritious diet is also important. ‘I think you can over-complicate things when it comes to nutrition and diet,’ he said. In order for Chris to keep bulked, Luke has the star on a diet of clean protein and vegetables. His standard meal plan includes a vegetable omelette for breakfast, for lunch a light vegetable salad and dinner is fish, rice and vegetables. In the past, Luke revealed Chris ate at least 3,500 calories a day, sometimes more, when he was bulking for his role in Thor.